For anyone who knows well about China, the reform and open-door policy in China thirty years back brought about dramatic social changes. They, however, may not associate it with the significant changes in sexual and reproductive health in China. The opening policy set the Chinese people free from the restrictive and oppressive mentality towards sexual and reproductive health issues. At the same time, it enabled greater involvement of a wide spectrum of stakeholders - the government, maternal-and-child health care, family planning, population study and women development – in addressing reproductive health issues through long-term collaboration with the international community. To be worth mentioning, the remarkable progress we have achieved so far should never be separated from the growing support from the Ford Foundation Beijing Office over the past two decades. As is known to us all, governmental delegates from nearly 200 countries and representatives from more than one thousand non-governmental organizations (NGO) attended the International Congress of Population and Development (ICPD) in Cairo in 1994. They had hot debates and careful discussions surrounding key global issues related to population and development for the next twenty years. In order to address shared concerns while appreciating differences and promote greater international cooperation, the participants went through careful consideration, negotiation and modification. Finally, they formulated the Cairo Action Plan and accepted the WHO definition of Reproductive Health. The definition of Reproductive Health indicates that reproductive health is a broader concept than the traditional sense of family planning. It also includes sexual health, the purpose of which is not merely counseling and care related to reproduction. In addition, it addresses prevention and control of STI/HIV, infertility problems, safe abortion, prevention of tumors related to reproductive system, and protection and fulfillment of reproductive rights etc. It is far more than what we traditionally perceive health should include. The debut of the concept of Reproductive Health has marked an upgraded understanding about population, health and development. People have been paying more attention to achieving sustainable development through comprehensive human development and coordinated relations between population and economy, society resources and environment, a shift away from merely limiting population growth. The emerging concept of reproductive health indicates that the human society has a higher-level understanding of, and gives high priority to, the issues of human rights and development. As early as in 1948, WHO defined health as “a state of complete physical, mental and social well-being and not merely the absence of disease or infirmity.” People developed better understanding of health – it is not only an important asset for, but also one of the important goals of, social development, and it is an integral part of quality of life and the right to health is fundamental. In that sense, the new concept of reproductive health accepted by the ICPD Cairo Action Plan would exert profound impact upon different countries in terms of provision of health services and social development. For the past twenty years or so, Ford Foundation has been actively supporting a wide range of projects in China. They were significant enough and many of them generated far-reaching impact. For instance, sexual and reproductive health projects Ford Foundation supported in China improved, to a great extent, sexual and reproductive health services in China, and enhanced sexual and reproductive health quality of the Chinese people as a result. In order to highlight profound changes about sexual and reproductive health in China, Ford Foundation involved a bunch of well-known scholars and senior experts into a project aimed at documenting the true and objective history of sexual and reproductive health in China. They would draw experiences and lessons, and examine challenges and opportunities, and pinpoint its most possible future. That’s why we have the book today. The book discusses different topics, including population and family planning, women empowerment and gender equality, sexual and reproductive health services, sexual and reproductive health among young people, sexual health and rights, reproductive tract infection (RTI)/sexually transmitted infections (STIs)/HIV, the involvement of NGOs in the sphere of sexual and reproductive health, and reforms of the medical system etc. China’s population and family planning has been always the most controversial area of reproductive health, but the one with the greatest changes. With the support of Ford Foundation, the Chinese Government and agencies initiated numerous effective pilot projects from the eastern to the western parts of China. The people oriented concept well embraced by the international community for population and reproductive health has been introduced into China since the ICPD in Cairo in 1994. The new concept provided new insights that made a difference to the ways of thinking and doing in terms of family planning work. In a timely manner, the successful experiences obtained from the program areas have been replicated all over the country since 2000, which marks a fundamental shift of focus from population control to reproductive health. Women’s empowerment and gender equality is the prerequisite for reproductive health. Without gender mainstreaming, our efforts on reproductive health and rights would be in vain. The development of sexual and reproductive health has been reviewed and for new understanding through the perspective of women’s empowerment with the support of lots of historical facts. Underpinned by the resources-options-results framework, the author summarizes women’s empowerment in terms of sexual and reproductive health in China, discusses how we can translate women’s empowerment from theory into action, and promote its practice through advocacy. Undoubtedly this is an important chapter due to its practicability. In order to make sure that the Cairo Action Plan on the ground, it is important to improve the quality of sexual and reproductive health services. 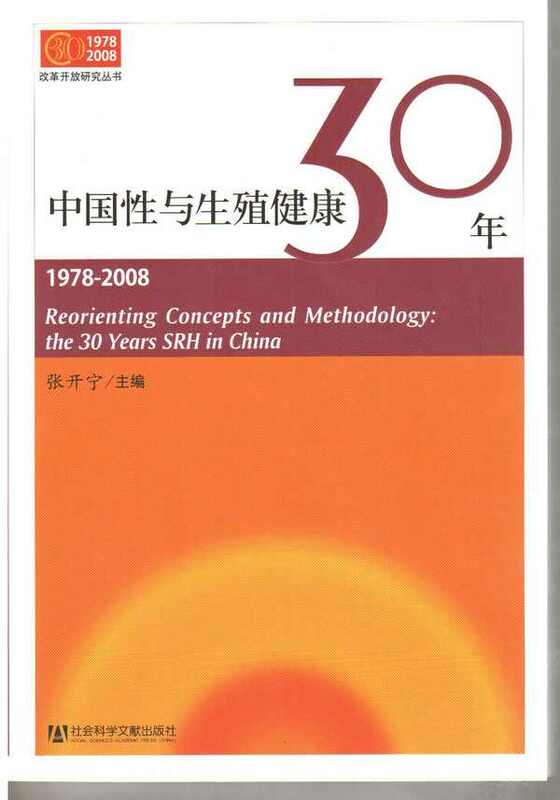 The chapter gives a systematic overview of the China’s great changes in the fields of family planning, maternal and child health care and prevention of RTIs over the past thirty years. After taking a look at the commonalities among the changes, the author sheds spotlight on Yunnan, a province unique for its changes in reproductive health services. The chapter describes the historical process of how new concepts from overseas were introduced, accepted and made appropriate to the local Chinese contexts. It is of great value because it illustrates through plenty of evidence, the course of China’s sexual and reproductive health development. Sexual and reproductive health among young people, although a bit sensitive, has been always one of the basic issues for discussion, both in China and overseas. The author examines the trajectory of the development of sexual and reproductive health among the young Chinese people using a lens of ‘perception-belief-practice’ model. Built upon the author’s valuable experiences in the inquiries into young people’s sexual and reproductive health in urban and rural settings and supported by lots of concrete facts and evidences, the chapter sums up experiences and lessons and discusses confusions and afterthoughts confronting China. Unquestionably, the ideas from this chapter will be of help in terms of providing better health education and health promotion activities to young people in the future. In addition, they can help young people to build equitable and responsible sexual relationships. HIV/AIDS is one of the key issues for reproductive health services to address. From the perspective of Reproductive Health, HIV/AIDS is a communicable disease that does great harms to people’s health and can be life threatening. The emerging concept of RTIs broke the ‘culture of silence’ and gave rise to a multidisciplinary approach that involves not only bio-medicine but also social sciences. The response to RTIs, STIs and HIV/AIDS contributes significantly to better reproductive health and improved accessibility to reproductive rights. The author successfully portrays the major changes from ‘silence’ to ‘commitment’ that took place in the fields of RTI, STI and HIV/AIDS over the past few decades following China’s opening and reform policy. In an era of an opening Chinese society with more social structural changes, the Chinese people have been experiencing a silent revolution with respect to their sexual practice, norms and relationship. As an experienced avant-garde sexologist, the author led the sexuality research in China and conducted lots of studies about sexuality, both theoretical and empirical. Pillared by her valuable academic experiences over the past decades, the author describes how the political, social, programmatic and individual contextual factors have shaped the diversity of gender and sexuality, and depicts how rights and sexual pleasure are given more priority. She also points out by using plenty of data, an increasing tendency of seeing, more studies and practice work in relation to gender and sexuality, and more of it into the spheres of reproductive health, HIV/AIDS prevention, education, and so on. Obviously, to make a difference to sexual and reproductive health requires an approach of the wide community involvement led by the government. Non-Governmental Organizations (NGOs) or Non-Profit Organizations (NPOs) plays an important part in it. The author describes a change from ‘driven by NGOs founded by the government’ to ‘the involvement of more NGOs or Community-based Organizations (CBOs) after the ICPD.’ The past three decades saw a rapidly increasing number of NGOs in China, and their greater involvement in sexual and reproductive health issues. NGOs play a bigger role and address a much broader range of issues. Their active involvement facilitated the changes in sexual and reproductive health in China. Moreover, the rise of NGOs has become one of the indicators for social advances in China. China’s medical system reform has been drawing lots of public attention. Restructuring of the health security system for a base population of nearly 1.3 billion people, public policies development and medical and health institution reform will exert significant impact on Chinese people’s sexual and reproductive health. China’s medical and health institution reform, although having achieved certain desirable outcomes through thirty years of hard struggle and innovation, should go much deeper. The last chapter of the book has an in-depth discussion surrounding this topic. The author suggests that, we still have a long way to go before meeting the sexual and reproductive health needs of the all on the one hand, and should look forward, full of hope for the future on the other hand. In order to ensure the quality of the book, Ford Foundation invited a group of high-level experts to review its draft. Of the independent review panels were scholarly officials from WHO, professors from the famous academic institutions such as Renmin University of China, Fudan University and Beijing Normal University, as well as senior research fellows from Chinese Academy of Social Sciences and Institute for Women’s Study of the National Women’s Federation They are: Gu Baochang, Zhao Pengfei, Guo Yan, Hu Shanglian, Zen Guang, Li Yinhe, Liu Bohong, Peng Xiaohui, Tao Chuanjin, Wang Xiaolin, Wang Feng, Zhang Meimei, Luo Chun and Fang Qing. The review panel all has rich experiences and insights in their respective fields. They experienced and witnessed by themselves, the historical advance of China’s sexual and reproductive health. They highly acknowledged all the changes happening in this field. Their pertinent comments made it a much better book. I would like to extend my sincere gratitude to them. We are grateful to Ms. Eve Wen-jing Lee, Ford Foundation Program Officer as she has been involved in the planning and organizing of the book project since the beginning. Her keen suggestions as well as her rich experiences in sexual, reproductive health and rights contributed significantly and positively to the making of the book. We would also acknowledge Ms. Shi Xuehua from Ford Foundation for her patience and coordination during the whole course of the book project. Without her support, we can barely have the book in shape so soon. Wen Yuqun from Yunnan Institute for Health and Development, as the editor of the book, carefully reviewed and fine-tuned all the Chinese drafts. From her work we can see her extraordinary professionalism and meticulous attitude. For a great deal of editing and compiling work in the making of the book, we should also express our heartfelt appreciation to colleagues from Yunnan Institute for Health and Development, such as Zhang Nan, Zhao Shuliang, Zhang Nanjie, Zhang Shanshan, Li Zhenghui, Gao Yingying and Chen Jinling. Special thanks should also go to the Social Science Literature Publishing House, particularly the editors such as Mr. Tong Gengxing for their great support. All over the world, sexual and reproductive health remains a fresh new territory with a lot to explore and research in the future. There could be some errors in this book we may not be aware of. However, we humbly expect that the book is not an end but a start point that invites more insightful comments from numerous readers and colleagues. Let’s join our efforts to improve sexual and reproductive health as a way to make a difference to the lives of myriads of Chinese people.